Since its inception as a fully-fledged University, the Harare Institute of Technology under the astute leadership of Engineer Quinton C. Kanhukamwe has grown from strength to strength. The Institute received accolades both on the local and international scene in recognition of academic excellence, engineering innovation, and innovation in the areas of the Institute’s mandate which are technology development, incubation, transfer and commercialisation. Engineer Kanhukamwe has highlighted that the role of the Harare Institute of Technology is to actively contribute to Zimbabwe’s development agenda, through relevant research. "We are fully aware that unless a country invests in a strong framework for indigenous research, in a milieu conducive to creativity and innovation, and in the ability to translate innovation into wealth and value creation,- then its status may be challenged by a modern day form of colonialism – an intellectual colonialism leading to social and economic subservience," he always reminds everybody. Research at HIT is premised on the need for the Institute to make a lasting contribution to the country’s industrialisation agenda. Research is therefore designed to respond to the Mandate whose scope dictates that researchers’ deliver tangibles in the form of Patents, Utility Models, and Copyrights which are sustainable and industrially applicable. HIT has since pursued a robust IP registration and commercialisation route. Engineer Kanhukamwe, was officially installed as Vice Chancellor on 23 October 2014 by the President of the Republic of Zimbabwe and Chancellor of the Harare Institute of Technology, His Excellency President Robert Mugabe. In his acceptance speech as the First Vice Chancellor of the Harare Institute of Technology, Engineer Kanhukamwe unveiled the ten key objectives (Ten Point Plan) which would inform key policy decisions during his tenure. The ten objectives outline issues of strategic importance to the continued success and development of the Harare Institute of Technology such as the greater impetus to research and research output, the introduction of post –graduate programmes, the promotion of scholarship and infrastructural development, among others. His career began in 1991 when he was appointed lecturer at the Bulawayo Polytechnic. In 1992, he moved on and was part of the founding team of academics at the National University of Science and Technology. In subsequent years, he proved his mettle leading to his appointment in 1999 as Chairman of the Industrial Technology Department and subsequently Dean of the Faculty of Industrial Technology. He also served as Director Designate of the NUST Technopark. During this time also taught at Postgraduate level at NUST and UZ. In 2003 he was appointed Chairman of the Transformation Committee of the Harare Institute of Technology by then Permanent Secretary for Higher and Tertiary Education, Dr Washington Mbizvo, which came up with the roadmap for developing HIT into a fully-fledged university. The promulgation of the HIT Act [Chapter 25:26] in 2005 was in part the outcome of the work of the Transformation Committee under his leadership. From 2005 to 2008, Eng. 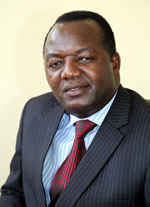 Kanhukamwe operated as Pro-Vice Chancellor of HIT. He was then mandated to lead HIT as the Acting Vice Chancellor in 2008, a position which he held until this appointment. During this time Engineer Kanhukamwe managed to set up university structures creating four Schools offering 15 ZIMCHE accredited Bachelor of Technology Honours degree programmes and four Centres that bolster the HIT mandate. Currently, he is robustly pursuing the offering of postgraduate programmes that will make a huge impact on the Zimbabwean Industrialization agenda. For his sterling contribution to the development of science and technology in Zimbabwe, Eng. Kanhukamwe has received more than 10 local and regional awards. He has signed more than 21 collaborative agreements with renowned universities and technology related institutions worldwide that have become the platform for curriculum development, staff development, technology transfer and quality assurance. He has well over 40 publications in refereed journals. Eng. Kanhukamwe holds an MSc in Engineering and is a member of the following professional bodies; Institute of Industrial Engineers (MIIE-USA), Institute of Cast Metals Engineers (MICME-UK), Professional Engineer- Engineering Council of Zimbabwe (MZwIE, Pr (ECZ)). He is currently pursuing a Doctor of Technology degree with the University of Tehran. Eng. Kanhukamwe is a board member of the Engineering Council of Zimbabwe, a member of World Technopolis Association (WTA), Southern Africa Regional Universities Association (SARUA), Association of African Universities (AAU), Oxford Club of Rectors, Zimbabwe Institution of Engineers, a Senator with the Junior Chamber International JCI, and a proponent of the innovation and technopreneurship philosophy and practice. Eng. Kanhukamwe’s research interests are in Technology Management, Modern Manufacturing, Techniques, Systems and Processes, Materials Management Systems, Optimisation of Cleaner Production in Manufacturing Industries, Maintenance Management as well as Properties of Manufacturing Materials. Engineer Kanhukamwe was born on 20 September 1964, and can speak Shona, Ndebele, English and Russian. He is married to Rumbidzai and they are blessed with a daughter, Dadiso and a son, Tanaka Carlton.